IT'S RAINING.....and boy do we need it.....and now on to a great challenge! I love mornings that inspire me. Thanks to Gina K. Designs Challenge and Stampin Sisters In Christ BLOG.GINAKDESIGNS.COM/2009/09/14/sisters-in-christ-challenge-sponsor.aspx this card came to be. For those of you who know me, snow people are my very favorite. When I saw the Sketch Challenge....I thought snow people and the rest is history. The rubber stamp is an older one, but one I love. It is a Sandi Gore Evans stamp licensed to Uptown Rubber Stamps. The name of the stamp is S'mores. To me it is a dad sharing stories with his child. The striped paper is unknown, it is affixed to Suede paper from Hot Off The Press, and of course... Dew Drops. The Hexagon is from Spellbinders as is the corner die. I used Tombow markers to color the image and Tim Holtz Antique Linen Distress Ink to highlight the hexagon. The edges were all chalked in Pumpkin, by Color Box Fluid Chalk . If anyone is looking for a great selection of suede papers, my favorite place is: www.franticstamper.com Fran has tons of colors and two sizes of paper to choose from. I'm off for a day of play with my cropping buddies. I am sure it will be a day of laughs and much productivity! 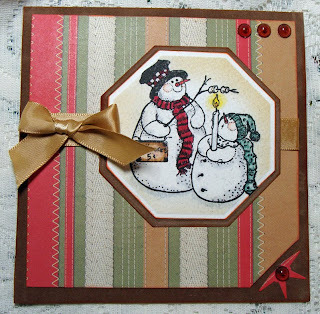 I'm hoping to get a good start on my Christmas Cards, and work with Carolyn on a scrapbook page. Hi Mary! :) LOVE this card! It reminds me of my girls making smores with their grandpa Bob. Very nice paper and such a CUTE image! Thanks so much for entering this in our SSC Challenge this week!! Love havin' ya!! :) Hope you have a super week. Very cute card Mary:) I love snowmen, they're so fun!! Great background for an adorable foreground. The image is delightful and colored just right. Hello from Germany, this is a really wonderfull piece of work! I feel like going through my stuff and create something too too. Thanks for inspriation! Of course I had to have a peek at your blog, and I am so glad I did! Your work is absolutely gorgeous!! I just love this Christmas card, the image is so cute! Great job on the coloring too! Oh, I just love it! Those snowmen roasting marshmallows is so adorable! your card is fabulous! Fun baubbles and great accent in the corner. Love the yummy ribbon as well. Wonderful job on the sketch challenge.